One of the creepiest and coolest traditions throughout human history is the obsession with preserving the face of a person after their death. The result is known as death mask, a cast made of a person’s face after they die. The cast is usually made of made of wax, clay, or plaster, and the process has been around for centuries. Many death masks were used to remember the dead. Today, death masks are a useful tool in the facial reconstruction of long-lost historical figures. They are even helpful when examining possible diseases and ailments that might have led to their deaths. With such important faces being preserved, there’s also been a great deal of controversy surrounding the authenticity of such masks. 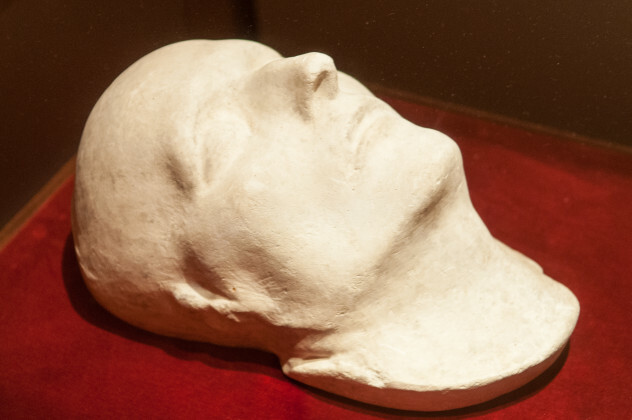 The story of Napoleon Bonaparte’s death mask is more of a mystery than anything else. Napoleon died at the age of 51 on the island of St. Helena on May 5, 1821. That much is known for certain. Two days after his death, the first cast for Napoleon’s death mask was made by Dr. Francis Burton with Dr. Antommarchi presiding. This cast would be the parent mold for the remaining three known to exist. Not long after the cast was made, the mask was supposedly stolen by a woman named Madame Bertrand and taken to England. After several years of trying to have the mask returned, Madame Bertrand did give Antommarchi a copy, which he authenticated from his own memory. Therein lies the problem, as many doubt the authenticity of the mask that was returned. The Antommarchi mask, as it’s called, looked proportionally different than Napoleon’s features in paintings. Rumors began swirling that the cast was actually that of Napoleon’s valet, Jean-Baptiste Cipriani. The story was further skewed when rumors spread that Jean-Baptiste Cipriani’s bones were actually placed in Napoleon’s sarcophagus at Les Invalides instead of the Emperor’s. Regardless of the rumors, the Antommarchi mask is the official mask on display at Napoleon’s tomb in Paris. The other copies of the Emperor’s death masks have been spread out over the world, sold and resold at private auctions, and ended up in museums, but they all link back to the authenticity of Dr. Antommarchi’s original mask. Is it real? The four known death masks of Napoleon Bonaparte have been the subject of controversy over the last two centuries, but it seems that the consensus is that they are likely to be from the face of the infamous Emperor and not Jean-Baptiste, as many conspiracy theorists believe. There’s no way to tell for sure, and the mystery will most likely continue for many years to come. In 1842, a mask bearing an uncanny resemblance to William Shakespeare was found in a ragpicker’s shop in Germany. Coincidentally, the date 1616—the year of Shakespeare’s death—was carved into the plaster, only adding to the intrigue. Since the mask’s discovery, it’s been analyzed and reanalyzed to try and pin down a conclusive answer as to whether or not it is, in fact, Shakespeare’s face. The only evidence academics and forensic scientists have to go on are six distinctly different portraits, his funeral bust located in Stratford-Upon-Avon, and the Davenant bust in London. Many studies have been done superimposing all of the components of the busts to the portraits and mask, and although there are striking similarities in the forehead and nose shape, it wasn’t until scientists observed the eyes that the evidence pointed toward authenticity. Through new forensic analyses, Professor Hildegard Hammerschmidt-Hummel, from the University of Mainz, was able to discover the same apparent swelling on Shakespeare’s left eyelid located on the death mask, the Chandos and Flower portraits, and the Davenant bust. 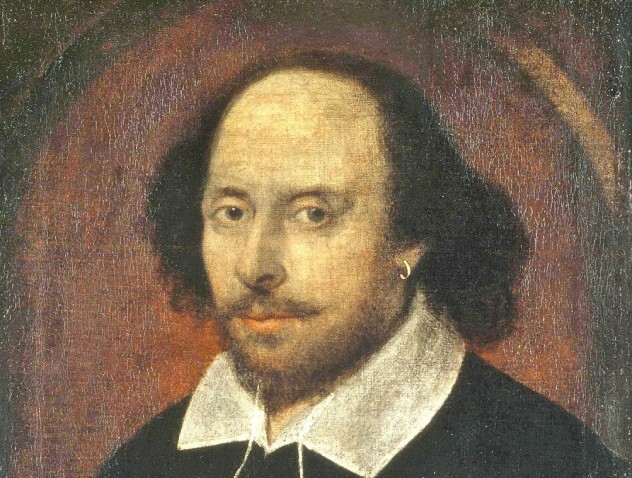 The growth on the eyelid and swelling in the nasal corner indicated that Shakespeare may have suffered from a rare cancer called Mikulicz’s syndrome. Hammerschmidt-Hummel’s work was criticized by many art historians since the Flower portrait and Davenant bust are usually considered to date from the mid-19th century, several hundred years after Shakespeare’s death. The Chandos portrait is likely to be a contemporary depiction of Shakespeare, the Flower portrait is almost certainly a 19th-century forgery, and the Davenant bust is probably from the 19th century as well. Regardless of all the evidence pointing to the authenticity of the death mask, a lot of experts still consider the cast to be a fake. Is it real? We may never know. Much like many details of the Bard’s life, his death mask’s authenticity also remains a mystery. 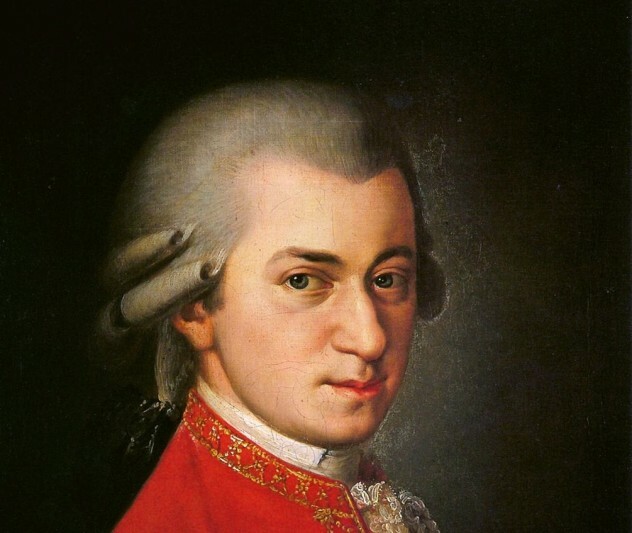 Mozart’s death has been surrounded in mystery since the 18th century. The death mask that allegedly belonged to the composer is one of legend now. Supposedly the mask was created by Count Joseph Deym von Stritetz very soon after Mozart died. It was displayed in his gallery and, when the Count died, his widow continued to display it until her death in 1821, when the mask vanished altogether. Many conflicting stories of the mask’s fate existed for the next 126 years. Some stories say it was smashed by Mozart’s wife and others say it was accidentally broken by an admirer. Then, in 1947, a bronze version of the mask—possibly a copy of the original cast—was discovered in an antique shop. Seeing the striking resemblance to Mozart in the cast, owner Willy Kauer called the Austrian Ministry of Education a year later to inquire about the mask’s authenticity. Unable to find more than a few consistencies with Mozart’s portraits and the mask, the tests were considered inconclusive. When the Mozarteum organized another examination of the mask in 1956, they focused on chemical testing to date the mask. It is speculated that the mask was created sometime between 1830–1869. Once again, the tests proved to be ultimately inconclusive, and the mystery of the mask remained. Kauer later gave the mask to Dr. Gunther Duda, who swears by the claim that the mask is Mozart, but its whereabouts now are unknown. Is it real? Odds are it’s probably not real even if the mask does exist somewhere in the world today. 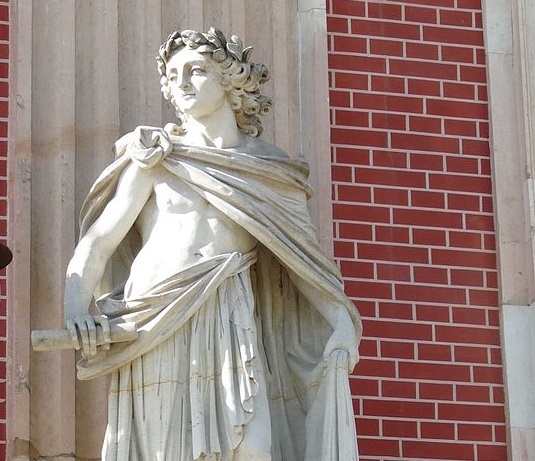 Almost all of the artifacts surrounding Mozart’s death seem to be fake or shrouded in mystery. Remember the story of his supposed skull? Teeth taken from his supposed skull at Vienna’s St. Mark’s Cemetery were forensically analyzed and compared to thigh bones from the Mozart family grave. However, DNA testing showed that none of these bones were related, and the skull’s authenticity could not be verified. At the peak of France’s Reign of Terror, Maximilien Robespierre was sent to the guillotine on July 28, 1794, at the ripe old age of 36. Marie Tussaud was ordered to make death masks of the infamous heads that rolled during the French Revolution, and Robespierre was high up on the list. Robespierre’s original wax death mask lives in Madame Tussauds in London, but there are also a few copies located in the Granet Museum in Aix-en-Provence and the National Museum of Natural History in Paris. The mask’s authenticity was brought into question when a terrifying facial reconstruction was conducted in 2013. The face featured many abnormalities and obvious scars that coincided with descriptions of Robespierre’s features and the conditions he may have suffered from. Those include obvious pox scars and infections, nosebleeds, vision impairment, jaundice, asthenia, and twitching of the eyes and mouth. A diagnosis states that he may have suffered from a rare autoimmune syndrome called sarcoidosis. Since the reconstructed face and symptoms seemed to match, most believed that the mask was indeed that of Robespierre and the resulting face was his. However, some historians believe Madame Tussaud lied about the authenticity of the mask to either promote her work or keep herself from being sent to the guillotine. 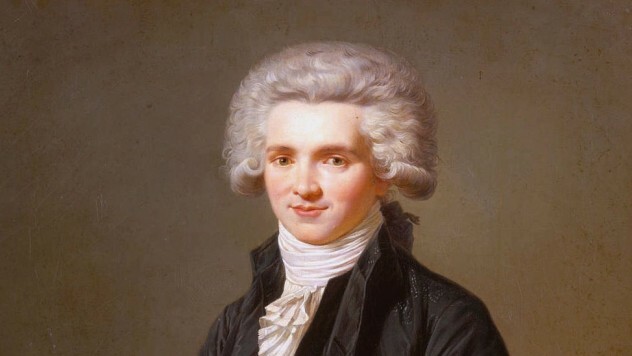 Furthermore, the reconstructed face cannot be that of Robespierre as it varies greatly from his portraits and because his jaw was shot to pieces in an alleged suicide attempt the day before his execution. Is it real? We can’t be sure if the mask is real considering it’s based entirely on the word of Madame Tussaud. It’s probably not real as the shattered jaw would have been very noticeable in the original mask had it been his real face. The one thing that is certain is that whomever’s face the reconstructed mask is made from has quite possibly one of the scariest faces in history. Between the Apartments of Eleanor and the Halls of Priors in the Palazzo Vecchio, there is an object resting alone in glass. That object is the death mask of Dante Alighieri—maybe. For centuries, the mask (also known as the Kirkup mask) has been considered to be the real face of the poet cast directly from his face after death. However, recent studies have gone to show that it’s likely the mask was made in 1483 by Pietro and Tullio Lombardo. That’s 162 years after Dante died. Furthermore, it is believed that the mask is probably a likeness of a lost effigy from Dante’s tomb in Ravenna. The controversial mask was donated to the Palazzo Vecchio in 1911, where it remains to honor his contributions to Florence. 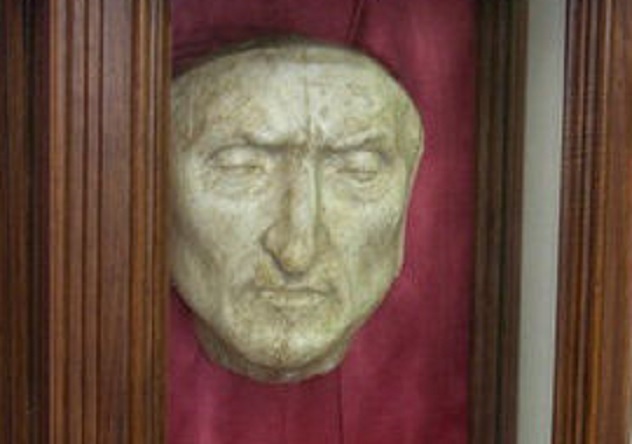 In 2007, Italian scientists made a reconstruction of Dante’s face using not the Kirkup mask, but calculations made on Dante’s skull by Professor Fabio Frassetto in 1921. It is believed that Fressetto illegally broke into Dante’s crypt to remove the skull, made measurements, and created a plaster cast. Is it real? It has been concluded that the Kirkup mask is not the infamous poet’s death mask. More than likely it is just a close likeness made many years after his death. As far as the reconstruction goes, it may or may not be the real face of Dante as the bones have not been decisively proven as his. Conspiracies have swarmed about John Dillinger’s death ever since he was shot outside the Biograph Theater in Chicago. Every detail (from the night he was shot to the circumstances of his funeral) has been brought into question to determine whether or not Dillinger pulled the greatest heist of all time. Eyewitnesses at the shooting claim the murdered man had brown eyes whereas Dillinger’s were gray. More speculation was brought about when it was made public that his father and sister did not immediately identify the body on the slab as John Dillinger. One of the issues with the theory is that John Dillinger underwent numerous plastic surgeries prior to his death to make himself less conspicuous in public. This included having his fingerprints altered or removed entirely for identification. Naturally, this led to some confusion as to whether or not the man who was shot down was, in fact, the infamous gangster. 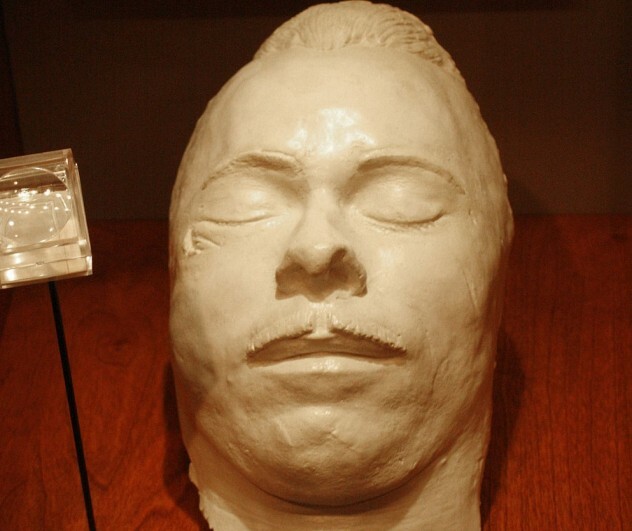 It is widely accepted that the man was John Dillinger, and his death mask offers a glimpse at the face that caused so much controversy. Plastic surgery or not, there is no doubt it offers a striking resemblance to the gangster and has become something of a symbol for Prohibition and the end of the era where tommy gun–wielding outlaws took over. Is it real? There’s no denying that the death mask on display is real and a documented authentic mask. The controversy lies in whether or not the man shot down was actually John Dillinger. It seems likely that both the body and the mask belong to Public Enemy Number One, but conspiracy theorists make a compelling case. Robespierre wasn’t the only head Marie Tussaud was employed to make a mask of at the peak of the French Revolution. 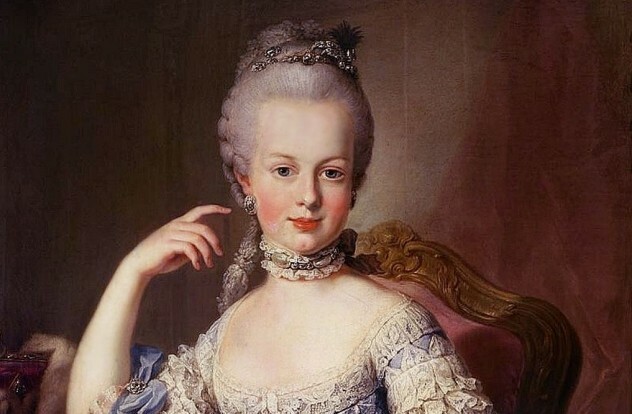 Two of the heads that made her a household name belonged to King Louis XVI and Queen Marie Antoinette. It is said that she was obliged to make a cast of the dead monarchs’ heads shortly after they were put through the guillotine. The wax death mask of Marie Antoinette can still be found at Madame Tussauds in London. The question of authenticity isn’t much of a topic, as it’s common knowledge that Marie Tussaud took the cast of Marie Antoinette’s head. The controversy lies in the fact that the wax mask is all that remains of the dead queen. There is no record of a plaster or clay cast from which the wax head was made and there are no copies from the original known to exist except at the wax museum. Even some spectators have issues with the original. It seems as if Tussaud took liberties in applying the ears to the face. With wax, it is hard to add any external features without cracking the mask altogether, so this is not an uncommon practice. Nonetheless, it is the only known death mask of Marie Antoinette to exist in the world today. Is it real? It’s safe to assume that if Madame Tussauds was able to acquire the actual guillotine that decapitated Marie Antoinette, then the wax death mask is also real. It has always been widely accepted that the wax head in the London exhibit does indeed belong to the executed Queen of France. 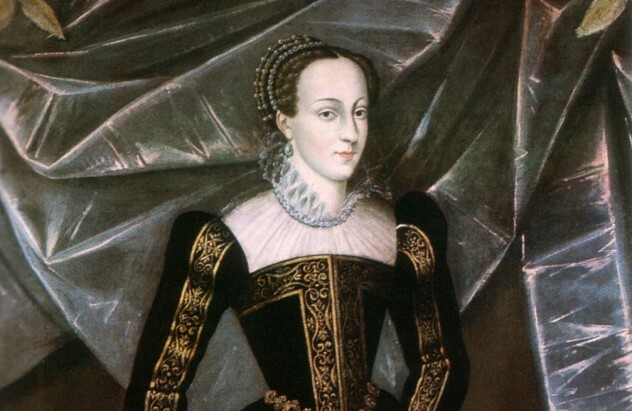 In 1587, Queen Elizabeth I ordered the execution of her cousin Mary, Queen of Scots, for treason. She was beheaded after three painful strikes. As was the custom, a death mask was created immediately after her beheading. There are two known copies of her mask in the United Kingdom—though four were supposedly created—as well as one at Falkland Palace, based on her effigy at Westminster Abbey. The Lennoxlove mask is small and widely accepted as the original mask since it has been in the possession of the Hamilton family for over 250 years. Further evidence includes the Hamilton family being in possession of Mary’s jewelry in addition to the mask. 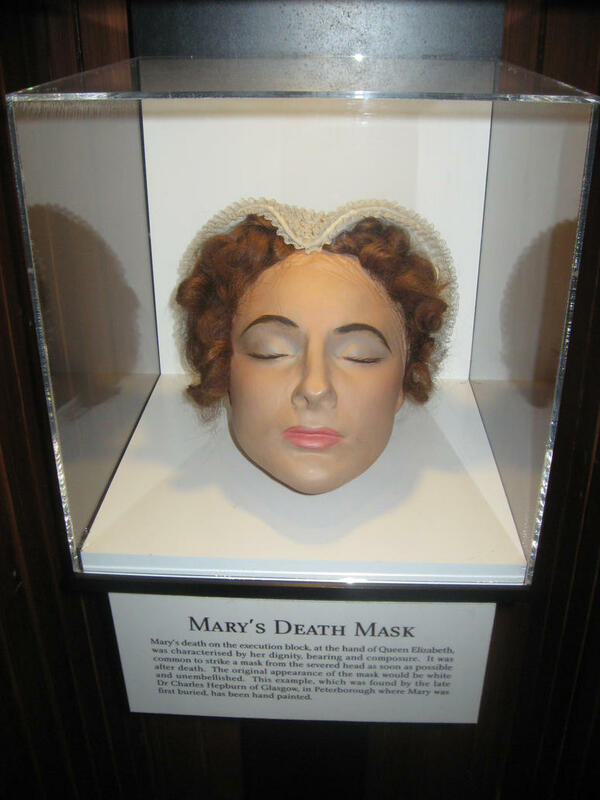 The second mask was found by Dr. Charles Hepburn in Peterborough, where Mary was originally buried. This mask is hand-painted and looks significantly different from the Lennoxlove copy. It is currently being displayed in a museum dedicated to Mary in Jedburgh, where it is believed that she stayed after falling ill. The mask’s authenticity is consistently brought into question as the features don’t match up to the Lennoxlove mask or many of Mary’s portraits. With that being said, both are considered “the real deal” and displayed as such. Is it real? The death mask at Lennoxlove is most likely real, but we cannot be certain. Documentation claims the mask was made immediately following Mary’s execution, though the eyelashes were added at a later time. As for the beautifully painted wax head in Jedburgh, let’s just say a lot of artistic liberties were taken in the making of that mask, if it is even of Mary at all. 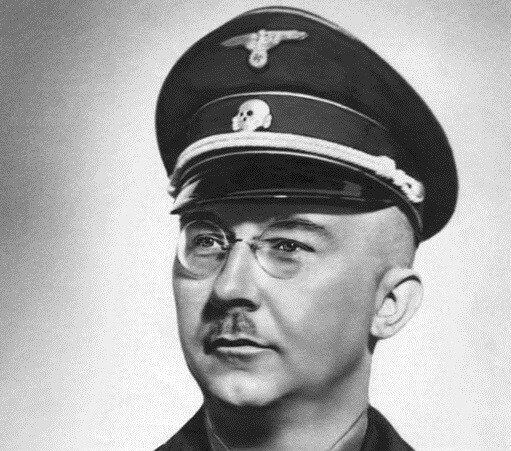 As a leader of the Nazi Party, Heinrich Himmler committed suicide on May 23, 1945, after biting into a cyanide tablet in order to avoid a war crime conviction. After his death, two death masks were created by British intelligence officials as proof of death. One mask showed a contorted and grotesque face while the other was relaxed and rather serene. What happened to the twisted mask is unknown, but the second mask is currently on display at the Imperial War Museum in London. Himmler’s body was buried in an unmarked grave and, to this day, the location is still unknown. For this reason, many conspiracy theorists jumped to conclusions as to the authenticity of the mask on display and what happened to the first mask. The mask bears an uncanny resemblance to Himmler, so it is widely believed to be a cast of his face. Is it real? It seems to be undisputed that the death mask belongs to Himmler. Conspiracy theorists try to claim otherwise, since the whereabouts of his body are mysteriously unknown, but in this case it’s safe to assume the cast is of the dead Reichsfuhrer. In 1876, a man named Heinrich Schliemann discovered an ancient grave site in Mycenae. The discovery was spectacular enough, but after getting to the bottom of the burial shaft, he noticed that five of the bodies had death masks made entirely of gold. One mask in particular differed from the others due to its three-dimensional design and the extreme attention to detail on the features. Schliemann was wholly convinced that he had discovered the tomb and body of Agamemnon, the commander of the Greek forces during the Siege of Troy in The Iliad. He continued to back up his claim by mentioning that the other men in the tomb site did not have masks, but weapons, making them warriors. Furthermore, the intricate gold mask represented a very high status of wealth that would fit with the story of Agamemnon. There are many skeptics that doubt the validity of the mask, and it seems they have compelling evidence to back up their claims. Archaeologists have done extensive research on the mask and state it was probably made sometime between 1550–1500 B.C., which is earlier than the lifetime of Agamemnon. In addition, Schliemann had a reputation for contaminating his own excavations by placing artifacts in the dig site for his own benefit. Regardless of what happened or whom the mask belongs to, it is currently being displayed in the National Archaeological Museum in Athens, Greece. Is it real? The Mask of Agamemnon is definitely an ancient artifact and death mask of some long-dead legend. Is it the face of Agamemnon? Science says no, but it was fun to think about while it lasted. Morgan Swank is a professional joke writer, social media guru, and all-around list maker. Follow her on Twitter @MorganSwank.